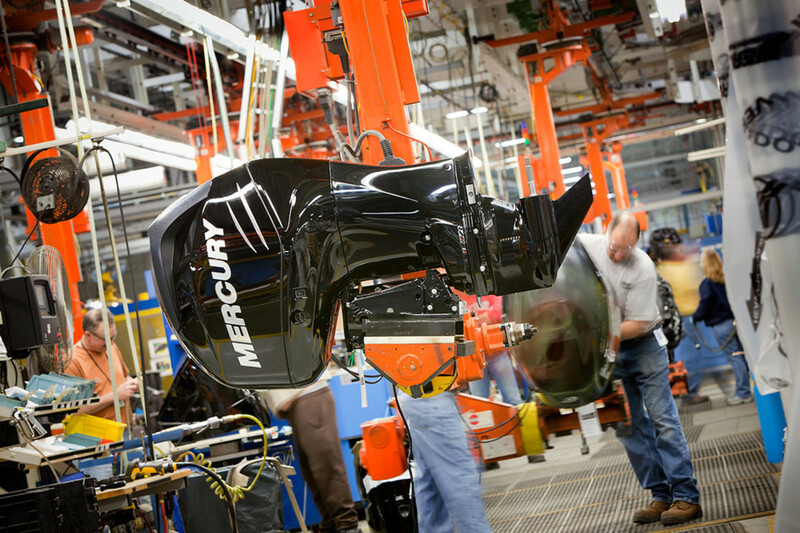 One of Mercury&apos;s new 4-strokes hangs from a "J-hook" during assembly at the plant in Fond du Lac, Wisc. FOND DU LAC, Wis. — At center of the room, the lower end of a new 115 Mercury 4-stroke passed through an opening in the floor into 4 feet of water. I was standing in the sound lab at Plant 12 (the Product Development and Engineering testing center) at Mercury Marine’s Fond du Lac manufacturing headquarters in Wisconsin. About a dozen microphones dotted the room, and a mannequin’s top half — with mics inside his ears — faced the engine. A flat sphere about the size of an extra-large pizza pan holding 54 microphones and one central camera also pointed toward the engine. A knee-high tripod held this acoustic array of mics and camera, which allow testers to pinpoint engine vibration and sound abnormalities. The mannequin records the engine “sound signature” that engineers use for playback to help them fine-tune the engine sound. The sound room was just one of several sections of the Mercury plant that I and other journalists were able to tour last month during a three-day press event. The engine maker’s $17 million expansion was completed this summer. The sound lab has been in use since 1999. Mercury has buttressed its facilities with 38,000 square feet of manufacturing space for die-cast and machining. The undertaking was prompted by the closing of a 700,000-square-foot plant in Stillwater, Okla., and moving much of the work here. Since 2009, the engine maker — founded in 1939 by Carl Kiekhaefer — has invested more than $500 million in PD&E and expansion and has been steadily hiring. It also has spent $300 million on research and development to support the design and manufacture of new products. At a press event in nearby Oshkosh, Wis., in June, Mercury introduced a 4.5-liter sterndrive gas engine and three outboards — 75-, 90- and 115-hp second-generation 4-strokes. The tour also included a look at Plant 15 — which includes product testing — and we toured both MerCruiser and outboard assembly areas. The last stop was Plant 17, the high-pressure die-cast area that was recently expanded. I will have reports in the next issue of Soundings Trade Only about the engines, Mercury’s new museum and the plant. I was fascinated with the sound room, which is about 1,000 square feet. Wedge-shaped protrusions covering the walls and ceiling absorb noise, and the floor reflects sound — just as the air on a bay or lake soaks in sound and the water reflects it, said Jeff Etapa, technical lead of the sound lab and the Noise, Vibration and Harshness dynamics test team.